Sorry Maneschevitz, but I see no reason to make matzo balls from a mix — they’re pretty simple to make from scratch. I also think that the whole search for the perfect matzo ball recipe is a bit overrated. Matzo (matzah) balls are basically matzo meal mixed with egg, and everything else is simply a matter of taste. Maybe I’m saying this because I haven’t tried the world’s best matzo ball yet, but until that time comes, I’m happy with my own modest version. Since there’s no chicken in our kitchen, this soup’s flavor had to come from something else. I put a bit of hot paprika in my matzo balls, and made a vegetable-intensive soup with Middle Eastern spices to go with them. There’s something to be said for matzo balls with a spicy kick. This matzo-egg ratio, coupled with the oil and water, gives a soft, slightly dense matzo ball. The turmeric adds color, while the other spices add flavor. This batter is a little too liquid to shape into balls with your hands, so I use an ice cream scoop and drop it straight into the boiling water. You could use a regular spoon, but your matzo balls might become free-form creations. Lightly beat the eggs, and mix with all the other ingredients. Let sit for a few minutes, so that the matzo meal absorbs the liquid. Meanwhile, bring a pot of salted water to a boil. Using an ice cream scoop, drop spoonfuls of batter into the water (my scoop holds 3 tablespoons, and I filled it halfway or a little more). Let cook until the balls inflate. 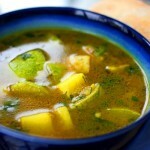 Remove from the boiling water, and serve with the soup, or store. 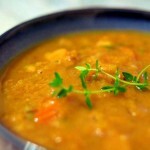 Chop and fry the onions, carrot, zucchini, celery and fennel in a small amount of oil in a thick-bottomed pot. Add the garlic after the other vegetables, so it won’t burn. Cover the vegetables in water (I used the cooking water from my beet salad as a broth), add all the spices except for the parsley, and bring the pot to a boil. When the vegetables are soft, add the parsley, chopped. Turn off the flame. 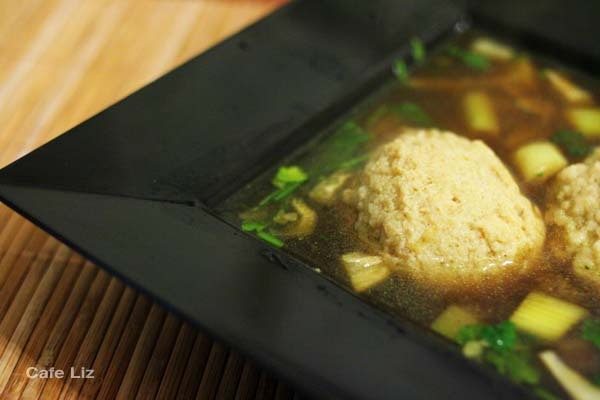 Ladle the soup into bowls, and add matzo balls. 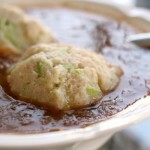 8 Responses to "Matzo balls with vegetable soup and Middle Eastern spices"
I make matzah balls all year, even with split pea soup. No reason not to, they’re good 🙂 That sounds like a nice combination. Let me know how it comes out! Thanks for visiting! Your food looks really good, but just so you know, according to the CRC (Chicago Rabbinical Council), cumin is considered kitniyot, also coriander and sesame seeds. I’m sorry, but I don’t know why (nor does my Rabbi!). I know you observe Sephardic customs, but I was able to get to the soup recipe from the Ashkenazi page. oops! I meant caraway seeds, not sesame seeds, which are obviously kitniyot. Hi Robin, thanks for calling that to my attention. Cumin falls into the gray area of what’s considered kitniyot — the OU says it’s not, but Star-K says it is. I’ll add a note in the text.